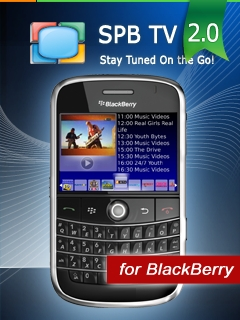 SPB TV 2.0 Comes to BlackBerry and Becomes Free | BlackBerry Blast! PB Software, a leading mobile software developer, has released a major update for the BlackBerry version of its flagship solution SPB TV to version 2.0. As SPB TV 2.0 is ad-supported it is absolutely free for the end-user and requires no subscription fee. To deliver uninterrupted mobile TV experience ads in SPB TV are shown only during the channel buffering time. SPB TV has reached the 3 million users milestone by January 2011. It has become so popular among users due to the best-in-class mobile TV interface. SPB TV is designed to provide users with the real TV-watching experience. For example the channelpreview allows users to see what is currently shown on a live channel before ever launching it. For those who are used to channel hopping the preview mode is a "must-have". In addition to existing features that include the catalogue with more than 150channels in over 20 languages, unique TV browser with quick channel previews, a TV guide with the list of current and upcoming TV shows, fast channel launch and switching, the new version offers also a video on demand (VOD) option. Another significant enhancement is the Advanced Video Codec (H.264) supportwhich improves video quality. As a result even with substantial lower bitrates the picture quality is strongly improved. SPB TV is also available on Android, bada, iPhone/iPad, Symbian, Maemo, Windows Mobile and WebOS smartphones as well as on feature phones. As a solution for mobile operators it allows carriers to couple SPB's proven solution with their own infrastructure and various subscription models. 4 mobile operators worldwide have already deployed SPB TV based mobile TV solutions.